In the United States of America, citizens enjoy freedom of religion. They also enjoy the separation of church and state, thanks to a document called The Constitution. That’s why some people get nervous when branches of the armed services start printing biblical verses on M-16s—or when cops in uniform deliver religious sermons. Police officers, like citizens, are free to worship Jesus, Allah, Buddha, or who and whatever else they like in their capacity as private citizens. But when a cop preaches or proselytizes in their capacity as a police officer, it generally tends to open up an enormous can of worms. 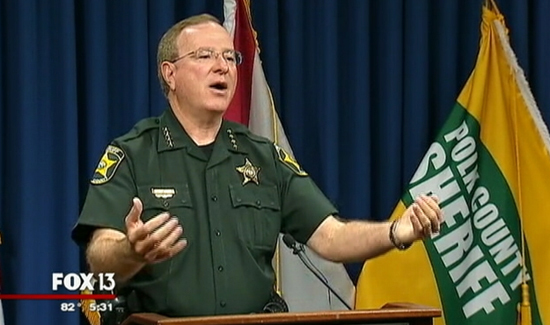 Polk County, Florida, Sheriff Grady Judd is taking some heat after a group says he broke the law by giving a sermon in uniform. “Wouldn’t the world be better if everyone behaved like a Christian?” Judd said in one of his recent speeches. Listen, I understand how people feel about this and while I don’t agree with Atheists I try to be sympthetic to anyone’s opinion. However, I do not like, nor appreciate false information no matter who puts it out. And for the hundredth time there is NOTHING in the US Constitution that talks about “Separation of Church and State”. The metaphor of a “wall of separation” comes from a letter President Thomas Jefferson penned to a group of Baptists in Danbury, Connecticut—a dozen years after the Constitution and Bill of Rights were ratified. The phrase is not mentioned in the Constitution’s text or in any of the debates leading to its ratification. What the Constitution’s First Amendment does say is that government shall make no law “respecting an establishment of religion or prohibiting the free exercise thereof.” It is well to attend to the actual words of the Constitution Nowhere is this more important than with the Establishment Clause of the First Amendment: forbidding an official establishment of religion is something quite different from the much looser, imprecise term “separation of church and state.” The Constitution only forbids government sponsorship and compulsion of religious exercise by individual citizens. It does not require hermetic “separation”—implying exclusion—of religion and religious persons from public affairs of state. If you stop Sheriff Judd from appearing in uniform, then you stop the President of the US from taking an oath of office on the Bible and that won’t happen folks. So, you may not like it. But, it there for those of us that do, and the last time I checked we are still the majority, not the minority.